Ivanka Trump attended the 2012 Good Awards which was held in New York City last night. Whilst she has the right to wear whatever she wants, she is not an Alexander Wang girl. It’s admirable that the uptown girl wanted to try a downtown look, but this tri-colour Alexander Wang knotted draped jersey dress is doing nothing for her. The draped panels are working against her cutting her in all the wrong places. To make matters worse the grey pointy pumps are making her feet look enormous. On the plus side, she’s a stunner from the neck up. 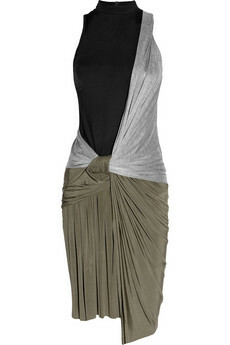 You can buy Ivanka’s Alexander Wang dress from Net-A-Porter US and Net-A-Porter International.